A rich, and deep Caribbean Rum blend of forgotten casks aged seven to twelve years. Saint Lucia is a volcano rising out of the eastern Caribbean Sea. And it’s still moderately active with steam and sulfur venting from the rain-forested mountain slopes. All that fertile volcanic soil is perfect from growing sugarcane. And where you have sugarcane, you have Rum. The island used to be home to several small Rum producers. But in 1976 a few of them gathered together and became Saint Lucia Distillers. Since then they have grown from one blended Rum to producing a range of twenty-five award-winning spirits. This is a GREAT story…. On May 2, 2007, there was a serious fire at the distillery. The main distilling building was damaged along with several storage areas. They were able to save the stills, but they ended up storing casks of Rum wherever they could. Well, a few casks were forgotten in an out-of-the-way corner. So what we have here is a naturally aged, older-than-normal expression that was created by accident. It’s a blend of their signature Rum in a mix of Bourbon casks aged seen to twelve years. And it’s really, really good! Issued now as a severely limited release worth buying and — ironically — a Rum you’ll never forget. 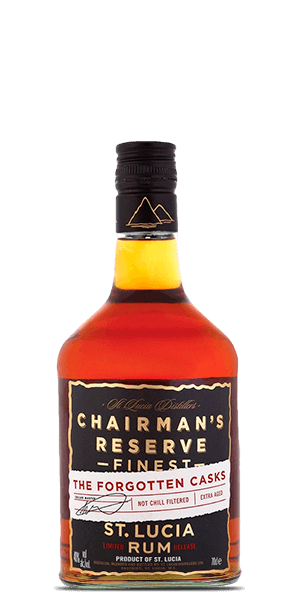 What does Chairman's Reserve The Forgotten Casks taste like? The Flavor Spiral™ shows the most common flavors that you'll taste in Chairman's Reserve The Forgotten Casks and gives you a chance to have a taste of it before actually tasting it.